Prov. Grand Master of Glasgow, 1847-1867. R.W. Bro. 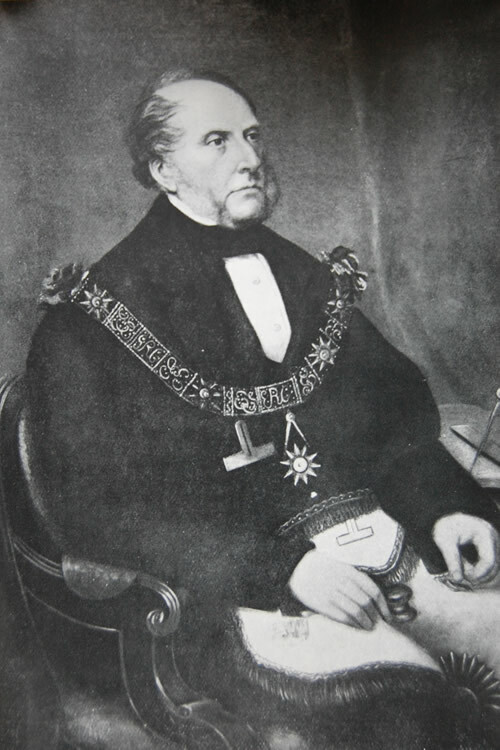 Sire Archibald Alison, Bart., became Grand Master of the Provincial Grand Lodge of Glasgow in 1847, and held the position until his death in 1867. He was called to the Scottish Bar in 1814, and became Advocate Depute eight years later. He was a prolific writer, on both law and history, and toured Europe after the Napoleonic Wars in quest of material for his famous “History of Europe”, which ran into fourteen volumes. He was created 1st Baronet by Lord Derby in 1852. There is no further mention of the ballot, but the winning ticket seems to have fallen to Lodge 272, as a small metal tablet engraved 272 is affixed to the frame. It is unfortunate that the records of Lodge 272 of this date are not in existence, or we might have learned more from that source as to this interesting picture, including the name of the artist which is, at present unknown.